In my previous blog post, I questioned Stanford economist Mark Duggan’s Senate testimony that workers’ financial incentives are driving a growth in Social Security Disability Insurance (SSDI) rolls. I showed that there had been no upward trend in age-adjusted disability incidence over the past 20 years, though there had been a modest increase for women offset by a modest decline for men. Though age-adjusted incidence isn’t rising, it’s possible that financial incentives have prevented it from falling. This blog post will focus on Duggan and Massachusetts Institute of Technology economist David Autor’s claim that disability benefits are replacing a rising share of low-wage workers’ earnings. Though this is a plausible and widely accepted hypothesis, there is surprisingly little evidence to back it up. In any case, this assumes workers are weighing the costs and benefits of working versus applying for disability benefits–a lengthy and difficult process that results in nearly two out of three applicants being denied–even though it’s doubtful that many applicants could instead choose to work. Are disability benefits becoming more generous? The average benefit awarded is roughly a third of the average wage, a ratio that has remained essentially unchanged since 1985. And as Harvard economist Jeffrey Liebman points out, rising inequality and other factors have reduced the value of disability benefits relative to productivity per worker. As a result, program costs increased only modestly over the three decades preceding the Great Recession as a share of GDP (from 0.55 to 0.68 percent) despite a much faster growth in enrollment. Though benefits have just kept pace with wage growth and lagged productivity growth, Duggan and Autor (2006) hypothesize that benefits have risen relative to lower-wage workers’ earnings due to rising inequality and a progressive benefit formula. Lower-wage workers are more likely to apply for disability benefits because they tend to be in worse health, are more likely to be in physically demanding or dangerous occupations, and qualify for fewer jobs that accommodate disabilities. However, an attempt by a Social Security Administration researcher to find support for this hypothesis came up short. Muller (2008) found that disability benefits have replaced a flat share of workers’ career earnings even for lower-wage beneficiaries (see Figure 1). Source: Muller and Lee (2004) and author's calculations using Continuous Work History Sample data. Autor and Duggan also point to an “earnings history effect,” whereby rising inequality will tend to inflate the measure of past earnings used to calculate benefits for workers with slower wage growth. In calculating benefits, past earnings are indexed to average wages so that benefits keep up with rising living standards. Though the past earnings of all workers are adjusted using the same index, workers with slower earnings growth (in this case, lower-paid workers) get a larger boost from indexation than workers with faster earnings growth (higher-paid workers), since more of their earnings were early in their careers. This shouldn’t affect the replacement rate of benefits based on wage-indexed career earnings, but it does mean that benefits for workers with slower-than-average wage growth will tend to rise as a share of recent or final earnings. Recent earnings may be a better proxy for prospective earnings than career earnings; and prospective earnings presumably weigh most heavily in workers’ decisions about whether to remain in the labor force, assuming they have a choice. Muller found that replacement rates based on recent or final earnings increased between 1984 and 2002 as Autor and Duggan hypothesized, though the increases were more modest than expected and extended to all but the highest earners. For example, hypothetical benefits for all low-wage workers in their 40s (not just those who received benefits) would have replaced 56 percent of final average 3-year earnings in 1984 and 58 percent 2002. Measures based on recent or final earnings are highly sensitive to business cycle fluctuations, so a change between any two years doesn’t necessarily indicate a trend. Muller did find that hypothetical replacement rates trended upward for most groups of workers, albeit modestly. However, actual replacement rates based on final-year earnings did not (see Figure 2). 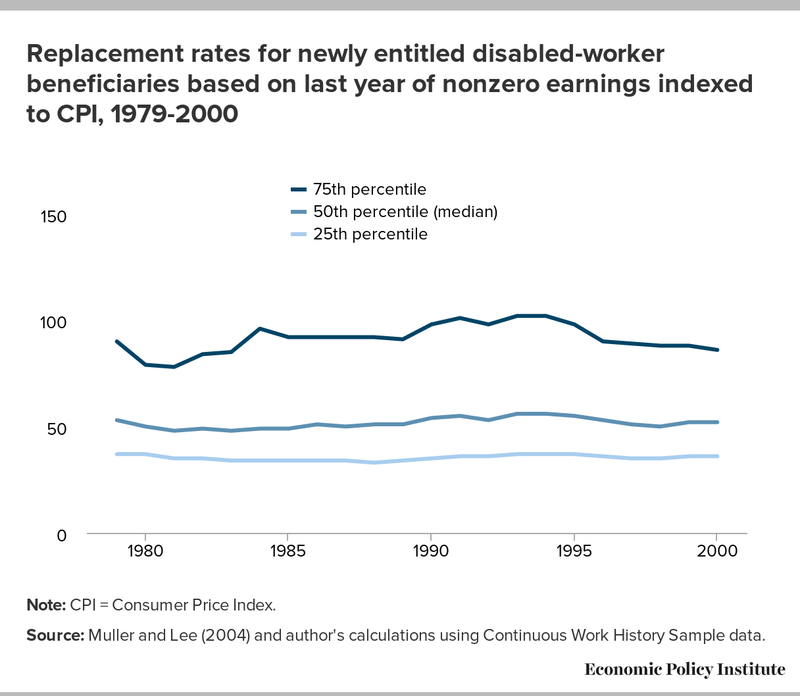 Of course, final-year replacement rates–which are much higher than replacement rates based on career-average earnings–reflect declines in earnings as workers become disabled. 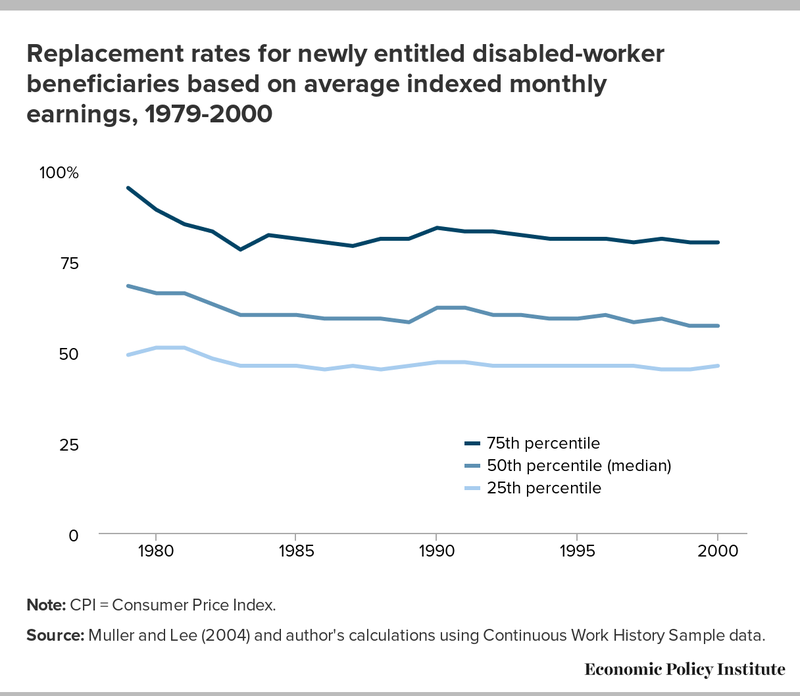 Still, there’s no hard evidence that financial incentives are luring more workers to apply for disability benefits. Next: Do Disability Benefits Reduce Work Effort? Previous: Are Disability Rates Increasing?